Darshan Singh is Singapore's official executioner. He has hanged more than 850 people in his 43 years on the job. He wants to retire. But he can't find a replacement. "He tried to train two would-be hangmen to replace him, a Malaysian and a Chinese, both in the prison service," [his] colleague said. "But when it came to pulling the lever for the real thing, they both froze and could not do it. 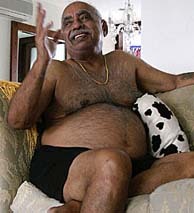 The pot-bellied grandfather and former Singapore caner has an all-time record of hanging 18 people in one day. He hangs his victims while wearing very casual attire, usually a t-shirt and shorts. Mr Singh is credited with being the only executioner in the world to single-handedly hang 18 men in one day – three at a time....To mark his 500th hanging four years ago, four of his former colleagues turned up at his home to celebrate the event with a couple of bottles of Chivas Regal. Mr Singh reportedly spends time getting to know the condemned prisoners, especially those who do not receive visitors or religious support. "He is a very kindly man and although it's his job to end their lives he does feel for them," his friend said. "Mr Singh tries to comfort them if they are completely alone in the world at such a horrible time." Van Tuong Nguyen, no previous criminal record, born in a refugee camp in Thailand, moved to Australia [with] mother and twin brother when six months old. Van told investigating officers he had agreed to carry a packet of heroin in order to pay off debts owed by his twin brother. He said he did not know how much he was being paid for the trip. It was his first trip outside Australia. He was such an amateur he ran through Changi airport. Amnesty International Australia has taken up his cause. He is to be hanged in two weeks. You can go to StopHanging.com and sign a petiton to spare his life. According to Amnesty International, Singapore executes more people per capita than any other country in the world. Anyone caught with 15 grams or more of heroin faces a mandatory death sentence. Alas, the high rate of executions for drug-traffickers has not reduced drug-related crimes in Singapore. Amnesty International Australia features a PDF, where two of his friends Kelly Ng and Bronwen Lew are asking people who care about Van's life to trace a copy of their hand as a gesture of solidarity. Why the hand? Because placing your hand against a glass window, on the other side of which a condemned prisoner sits and places their own hand, is probably the most poignant memory for those of us who have gone through this experience of contact to death row inmates. It is at once a gesture of solidarity hope and frailty. stopping crime has nothing to do with the death penalty, never has, except, i suppose, for the person being executed. capital punishment is the most explicit demonstration of the power of the state; the ability to legally take your life. geez, if it had anything to do with stopping or curbing crime, we'd be a world without it. on the plus side, it's pretty clear that, for this gentleman, it's nothing personal, it's just a job. If it was only Bush think what happy times would come out of that. "Oh Well", you can't always be happy all the time. but cpinva is right. Has he considered running a want ad in Texas? Sorry people, the Add has already been responded to, by an Australian gentleman in Darwin. Mind you, if he hadn't applied for the job, I just may have myself. cpinva , I found your comments on this issue quiet amusing, especially when you live in a country that has murdered millions of INNOCENT people all over the World simply on the basis of looking after Corporate America's interests. Oh, by the way, are not the occupiers of the U.S.'s gaols the end product of those very same Corporate interests in the first place ?? And, don't those very same Corporate interests make a PROFIT from those souls incacerated on their behalf ??? You're right though, silly idea of takin them out, no money in that, better to keep em alive thus earn returns for Mum and Dad investors. I just read the comment from itchyvet and the first person I thought of was Tim McVeigh. He hangs his victims while wearing very casual attire, usually a t-shirt and shorts. So in Singapore, execution isn't punishment enough--what's in that photo is approximately the last thing the victims see. I dunno, it's kinda like being hanged by Buddha. Murder must pay well in Singapore...look at the gut on that guy! I wonder if he thinks his god will forgive him all the blood on his hands. "Following orders" or "Just doing my job" are not valid excuses in my book.